Whether you're a cat person or not, you've gotta admit you might want one of these babies as a pet. Most people go to Belize for the warm Caribbean waters. But those who venture inland are rewarded with a lush rainforest, populated by thousands of species of plants and animals. Among them? The ocelot - the cutest of the wild cats, in our opinion. 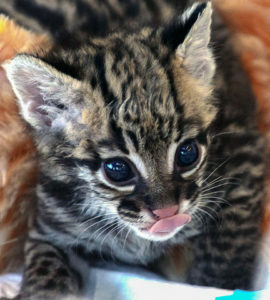 The ocelot is small, with huge eyes, rounded ears, and soft fur patterned like the mane of a clouded leopard or jaguar. The Moche people of ancient Peru often featured them in their artwork and worshipped them as gods and kings. Ocelots are so small and cute they’re sometimes owned as pets -- somewhat ill-advised ones. 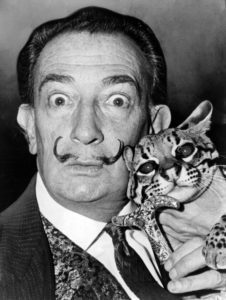 Famous ocelot owners include Salvador Dalí’s cat named Babou. Babou accompanied Dalí everywhere, on a leash with a crystal studded collar. One of the most popular accounts is of Dalí bringing Babou into a Manhattan restaurant and tethering it to his table, causing great alarm to a fellow diner. To appease the woman's fear, Dalí told her Babou was nothing more than a normal cat he "painted over with an optical illusion design." Talk about a fancy feline. Despite what Dalí claimed, ocelots are no house cats. These pretty kitties are fierce and possessive, frequently fighting each other to the death in disputes over territory. But just watch this video and you might forget about that little detail... Still can't get enough ocelots in your life? Check out this list to see if your zoo has some kittens!